Slain rapper Nipsey Hussle was remembered at a celebration of his life in Hyde Park. Jane Yamamoto reports for NBC4 News April 14, 2019. Nipsey Hussle's love of basketball was something he wanted to share, especially with younger generations growing up where he did in South Los Angeles. 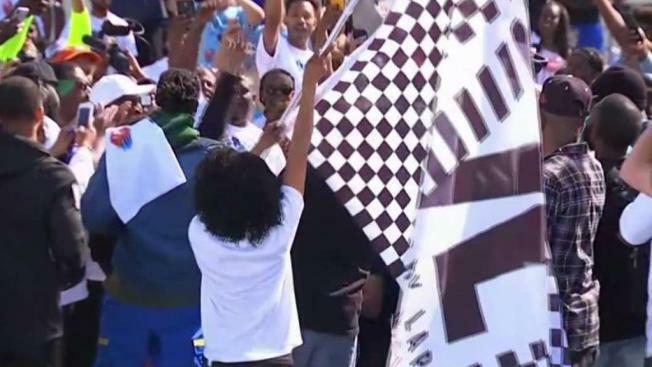 His legacy and appreciation of the game will live on at the corner of Crenshaw Boulevard and 60th Street, where artists created the Nipsey Hussle Memorial Basketball Court. The court outside Crete Academy non-profit charter school is painted a brilliant blue with a checkerboard border and a profile of Nipsey the neighborhood hero at mid-court. "His legacy will live on and his spirit lives forever," said Nick Ansom, CEO of the Venice Basketball League, which spearheaded the project. The court officially opened Sunday with a ribbon cutting ceremony, just days after a Staples Center memorial service for the slain 33-year-old hip-hop artist known for his generosity and committment to community programs. Nipsey was shot and killed March 31 outside his Marathon clothing store, located in about four blocks north of the court in Hyde Park. Ansom, who founded the Venice Basketball League in 2006 after he came to Southern California from France, said he had talked about doing a project with Nipsey. Both shared an appreciation for basketball and helping their communities, so a neighborhood basketball court made sense. "He spoke through his music, but he also spoke through his actions," Ansom said. "You have Nipsey (at mid-court) looking out toward his neighborhood and saying, 'I'm still here with you guys.'" The mural is about 46 feet wide, 78 feet long. Muralist Gustavo Zermano used a stencel from the middle of the court and worked his way out. Zermano grew up listening to West Coast hip-hop, like Tupac and Tha Dogg Pound. Hussle's music, which gained acclaim through his coveted mixtapes, seemed like the next step, but it was his involvement in the community that really earned Zermano's admiration. "When (Nick) asked me to be a part of this, I felt like I had to contribute something bigger, so that's when I pitched the whole Nipsey thing, like actually painting him on the court," Zermano said. "He was a big part of helping the kids, and when I heard it was at a school that's when I was like, it's for real." Nipsey's songs reference his entrepreneurship and a vision for the neighborhoods where he grew up, including the Crenshaw District. Hussle and a business partner bought the plaza in which Marathon is located with plans to revitalize the area with a residential-commercial development, according to a Forbes report. "Soak in everything he's been talking about for the last two years," Zermano said. "He's really dropping a lot of knowledge out there." Saturday's ribbon cutting is scheduled for noon at 6103 Crenshaw Blvd.